Do you miss tortillas? 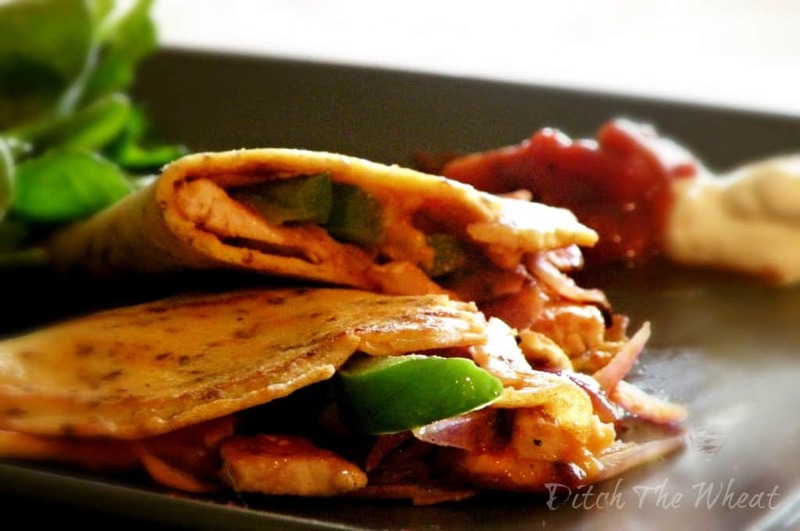 Then check out these simple low carb tortillas that are so easy to make. You just mix the ingredients together and cook! I miss tortillas and all the things you can make out of tortillas! I love making chicken quesadillas. I love eating tortilla chips (click here if you want to try my low carb tortilla chip recipe) For lunch today I made some low carb gluten free tortillas. I have tried various recipes for making low carb tortillas but each of them has their faults. Some turn out too cracker like and you can’t actually wrap them like a tortilla. These tortillas are adapted from Mark’s Daily Apple recipe for Primal Tex-Mex Tortillas. The tortillas taste slightly like a crepe so I added a variety of flours to stiffen the wrap and make it more tortilla like. What I like most about this recipe is its simplicity. There is no dough to make and roll out. You just mix the ingredients together and cook! 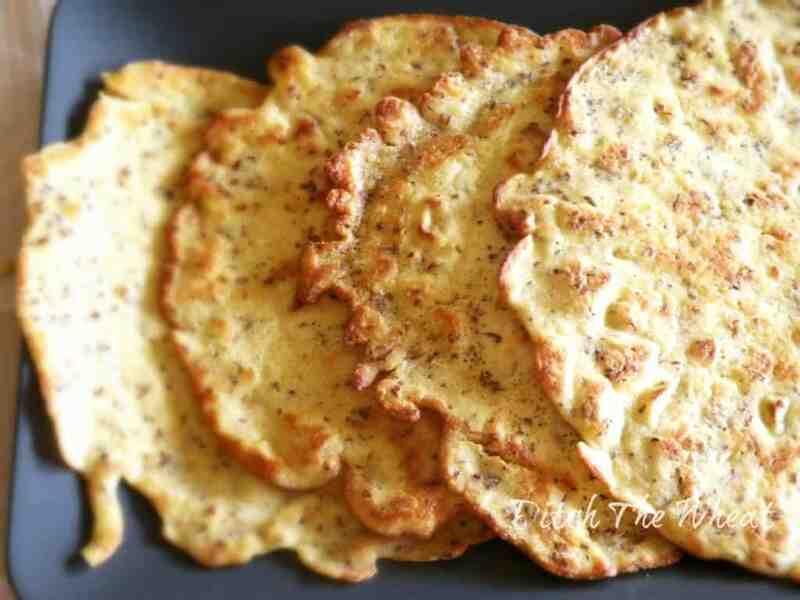 These are keto friendly tortillas because there are no starches used in the batter. 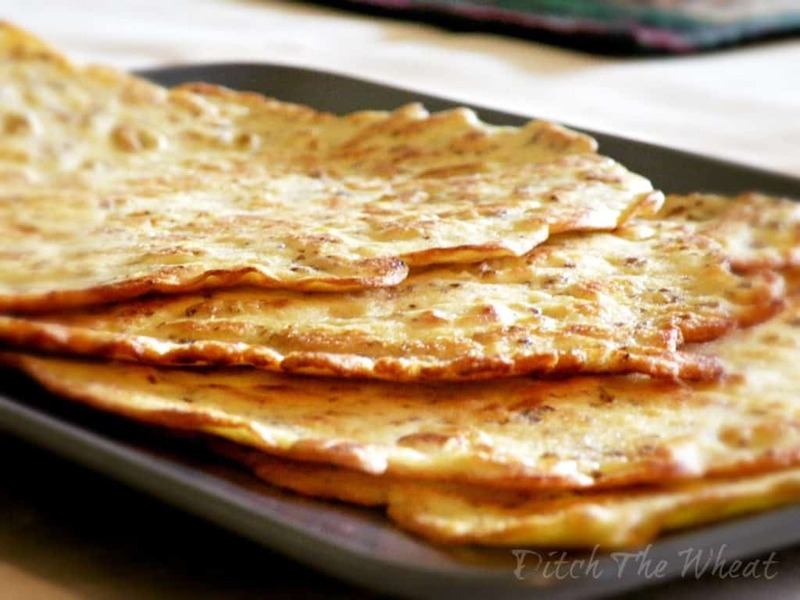 I do have a fantastic, almost like the real deal Paleo tortillas recipe in my cookbook, Ditch the Wheat, that contains some starchy flours but the results are amazing! In a bowl whisk together water, eggs, and olive oil. In a separate bowl mix together coconut flour, almond flour, flax seed and baking powder. Mix the dry ingredients into the wet ingredients. Whisking as you pour so clumps don’t form. In a medium to large frying pan heat several tablespoons of olive oil over medium high heat. When the oil is hot pour 1/4 cup of batter in the pan, tilting the pan so the batter spreads thinly. Cook the batter for about 2 minutes or until it is slightly “toasted” looking. Flip the tortilla and fry for 2 more minutes. Since we’re using low carb flours to create these tortillas they are not as bendable as regular tortillas. Please remember they are crepe like since we used a batter to make them. Can I Freeze My Low Carb Tortillas? Yes! If you want to make a big batch of them you could separate each tortilla by putting wax paper or parchment paper between them and then stack them and place them in a ziplock bag and place in the freezer. Thanks for sharing this recipe. I will definitely try it in the morning. I've been eating low carb since last October and recently went gluten free due to gluten sensitivity. In the directions, you say to use lime, but it's not in the ingredients. How much lime? I would definitely love to make these! These are fantastic! Mine didn’t turn out as crispy as your look, but I cut out some of the fat, so maybe that’s why. They taste great and hold up pretty well. They’re my new favourite low-carb tortillas. Thanks! I’m still searching for a great tortilla recipe:) I’m happy you liked them. Carol – How do you think these would hold up if wet? Do you think they could be used for enchiladas, or do you think they would fall apart? Hello! I just discovered your site and am impressed! You are very creative with your recipes and I can’t wait to try some! Oh and your recipe book, heading off to check that out soon. Question on the low carb tortillas – do you think I could bake in the oven instead of cooking on a skillet? I think that is possible. I’m not sure what temp would be best, maybe 350 degree F? Do you know how many carbs are in these? Wy is the nutritional information not available for this recipe? It seems odd to have low carb recipes and not include such important info. I stopped giving nutritional information because people complained that they thought the nutrition info was wrong. I followed your recipe EXACTLY, and they came out PERFECT. So much better than other tortilla recipes with just coconut flour. I dipped them in salsa and they really hit the spot. I added a pinch of salt! Well I won’t think ur wrong so can u please provide how many carbs sugar fiber etc its important for my diet thanks! Sorry I no longer provide nutritional info. You can use sites like fatsecret.com to find out the carbs. You can go to SparkPeople.com and they have a recipe builder. I have been on a healthier eating journey for over a year now (and down 77 pounds) so THANK YOU for posting this and your site rocks!! They’re like a pancake/crepe so they are easy to fold unless you fry them to a crisp. worst thing ever for me! I have no idea how you got yours to look sooo beautiful. Mine fall apart immediately after cooling slightly. Followed every step completely. Mine taste terrible. Did you use the same ingredients? These are great! Of course, I didn’t follow the directions, and they came out floppy and won’t hold together, but I made an “open face” burrito and it’s great! I’m practically typing this comment with one hand, because nestled in my left hand is my very first successful low-carb tortilla. I have tried to make tortillas four times previously with every permutation of flax, cauliflower, and almond flour, and everything crumbled in the pan (yes i ate those crumbs, but still). These have a great floury texture, and when one of the tortillas came out too wimpy to hold any fillings, i put in a little extra ground flax seed and the next had all the fortitude for fajitas. Excellent recipe. These sound and look great! We have egg allergies, do you think they would turn out ok with egg replacer? Or any other suggestions? Thanks! I’ve never worked with an egg replacer. I’m not sure if it would work. Thanks, I’ll try it out n see. These look great, I can’t wait to try the. A couple questions…first approximately how many should the recipe make using the quantities shown? Second, do these store well? Or are they best eaten right away. And if so what is the best way to store? I typically try to make enough stuff to get us through a couple days. Thanks. I’m guessing by the measurements they would make about 4. Not too eggy, not too coconutty, and they FOLD. And they HOLD. Ugh. They’re so lovely. 😀 Thank you so much! Baking the tortillas in the oven sounds easy! Can you remember how you did it?What temperature for how long? How did you bake them? More info please! You’ll have to figure that out on your own. I just made these exactly following the recipe for one exception. I substituted the almond flour for tapioca flour (starch). They fried up beautifully!! I cannot wait to load them up with my shredded pork carnitas. Thank you so much for this delicious recipe! They look lovely. I keep trying low-carb tortilla recipes, and although I have developed a nice sandwich wrapper, I’ve not quite gotten anything that looks quite as thin and flexible as yiour lovely gems there. I really look forward to trying these! What could I replace the coconut flour with? I’m allergic to coconut but really want a low carb tortilla! I don’t know what you can replace the coconut flour with. 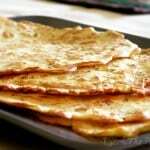 There are lots of paleo tortilla recipes out there that you could try that are almond flour based. These were amazing!!! I used bacon grease to coat the pan I heated them on. As they were cooking, I used the bottom of a grease coated metal measuring cup to spread them as thin as I could, without the tortilla breaking. Once they were mostly cooked, I pressed them into a tortilla bowl maker, and let them crisp in the oven. They were perfect for taco salads!!! They were super thin, and crispy. I made another batch and left them softer, so they were more like flour tortillas. They are so flexible. Based on the ingredients, there are about 2 NET carbs in each tortilla. Thanks for the carb count! This kinda makes me think about my three-ingredient gluten free naan, but a lighter, crispier version. I’ll be trying these!! I followed the recipe, I agree it did not work. Turned out more like floppy/delicate egg foo young than a tortilla. Good luck to those that try it. I’ve tried a similar version made with cauliflower- it was ok but tasted like an omelet. I can’t wait to try it this way. Thanks .. just started following you and look forward to going through your recipes. Do you think I could substitute “flax eggs” for the eggs in the recipe? No, I don’t think that would bind enough. Made these, didn’t enjoy them, more like little omelettes, was looking for more like a flour tortilla, oh well the search continues! Have any of you tried the finished product in a quesadilla maker? 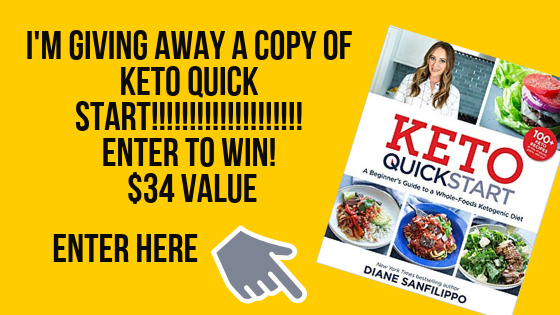 Carol..just joined your website.mso anxious to try your recipes! The tortilla recipe-question…. Can you make them ahead of time to store in the refrigerator? Have you done that? If so about how long would they hold up? Thanks again for your website ! The chips would probably go stale tasting if you made them ahead of time. I had no flax, so I had the brilliant idea of adding xanthan gum and increasing the water/oil/egg content. It was a thick batter at the end. When cooked,it turned into unsweetened, fluffy pancakes. Not what I was going for, so I tossed it. At least now I know how to make low carb pancakes. Made these to go with wraps tonight and they were great!! Thanks for sharing and Happy Thanksgiving! I found this recipe because we had the urge for some burritos. Have been eating gluten free and low carb for years for health reasons so I am pretty used to experimenting and having to deal with flavors and textures unlike the “norm”. This is not my first rodeo. 🙂 that being said, as a flour tortilla sub we have to say these were awful. As a GF crepe they would be fine. But no good for Mexican food. I am sorry but these taste NOTHING like a tortilla and EVERYTHING like a pancake. Looks delicious and the best thing is it is a low carb food. Thank you for sharing this one, I will try this at home. Wow !! Really I love this recipe. And so I want to make this today for my family. Thanks to you for sharing this great post. I’m confused. Should we presume from the pictures that this recipe makes 4 tortillas? Nothing in the insturctions gives a set serving or numbers serverd. This didn’t work for me at all 🙁 very eggy and fell apart. Could psyllium husk be used instead of flaxseed? As it’s such a small amount in recipe, and I don’t buy flaxseed, but make pizza bases using psyllium, I’d think it’d be worth a try. This is listed as low carb. So any chance of telling how many carbs? Think of someone wanted to use the recipe but cant because this tiny bit of information isn’t available!!!!!!! I made these tonight and they were great! Mine look just like your photo and the recipe made 4 as shown. I added some dried herbs to mine and we used them on the bottom of our chili dogs. I think these would be great with a little sweetener and cinnamon and spread with cream cheese. Use as a wrap for deli meats, tacos, sandwiches with scrambled eggs and a sausage link for an on the go breakfast. There are so many low carb options to use these wraps for. And I couldn’t believe how easy they were to make. Thank you so much for sharing this recipe. Thank you for this recipe! Made them yesterday (got 5 from my batter) ate 2 and saved the rest for today, the first one I reheated in a pan and then the others just I the microwave and they were great. Held together enough for my wrap! Yeah… So these are very much like the pancakes I have made in the past. Unfortunately not wrap/tortilla like. At least not in my book. But I saved them and will use them with a little butter and scant maple syrup for a sweet treat anyway! I think these are fantastic! I got 4 large and one mini tortilla. Your instructions were great, and I love the tortillas! Thank you!! How many tortillas does this make?? Is the recipe easily doubled or do I have to make each recipe separately?? I’ve tried several low carb tortilla recipes. None were worth repeating. This one is easy and surprisingly good! Thanks so much for posting.